Pastelón de Plátano Maduro (Ripe Plantain Casserole) combines the delicate sweetness of ripe plantains, flavorful juicy beef filling, & melting cheese. Pure bliss. Dominicans love their Pastelón de Plátano Maduro (Ripe Plantain Casserole), which is ironic, because apart from politicians, in this country there is nothing that is more maligned than the plantain. It’s accused, no less, of being partly responsible for our island’s rampant underdevelopment. It is said to block the brain and stop intelligence from flowing, according to some; while others say overindulgence leads to a dazed stupor. And there are even some who go as far as to say that if American children speak English from a young age, it’s thanks to the “conflé” that they eat for breakfast, as opposed to mangú. Myths, dear readers, pure myths. In this article, we demonstrate that there are vitamins and much more behind the peel and that despite all efforts to the contrary, we’ve got where we are today thanks to its nutritional benefits, taste, and versatility. Long live plátanos, and we’ll go on buying them even if they are rabizas or undersized runts. Plantains and bananas come from Asia. History tells us that when Alexander the Great arrived in India, he was surprised by their delicious taste and brought them to Greece. This was in around 327 BC. They spread further across the world thanks to Arab sailors who planted banana and plantain seeds along the east coast of Africa. Although Portuguese explorers introduced the crop to the new world in 1516, African slaves played a key role in making it a central feature of the continent’s cuisine, mainly in the Caribbean, Central America and the Pacific and Atlantic coastlines. For better or for worse, bananas are one of the world’s most popular fruits. Plantains and bananas only grow in temperate climates and it’s estimated that 12 million tons are cultivated every year. 10 tons come from Latin America. The banana (Musa cavendish y M. Sapientum) and the plantain (Musa paradisiaca) are two varieties of the same fruit, a long-leaved plant of the Musaceae family. Each region has its own varieties and peculiar names: In some countries such as Mexico, Central America, and Spain, “plátano” is the word used for both banana and plantain, and the plantain is distinguished by the name “plátano macho”. In the Spanish-speaking Caribbean, we call the banana “guineo”, while the Venezuelans call it “cambur”. Dominicans call fried plantain slices “fritos” or “tostones”. The main difference between bananas and plantains is that the former has more sugar and less starch, while the latter has more starch than sugar and has to be cooked before eating. A plantain’s taste depends on how ripe it is – the riper, the sweeter. Bananas are usually eaten raw, but can also be baked, fried or boiled in a variety of recipes. In India, for example, banana features in savory dishes. Bananas are a good food for growing children: nutritious, an excellent source of energy, rich in vitamins A, C and K, glucids and potassium, as well as other minerals. Green plantains are a better source of energy than bananas (about 285 kcals per 100g) and are an ideal snack for athletes. Most plantain and banana-lovers know that they should be stored at room temperature. To slow down the ripening process, wrap them in a newspaper and keep them in the fridge. It’s also possible to peel and slice plantains for ‘tostones’ and store them in the freezer. Some even fry them once and store them to save time. Whether fried, boiled, sliced or mashed into a Mangú (which a Dominican would never call ‘purée’), mofongo or as a side dish to almost anything, Dominicans remain faithful to their plantains and seek them out and taste them everywhere they go. Aside from Mangú, Pastelón de Plátano Maduro (Ripe Plantain Casserole) is possibly the second most popular plantain recipe in the DR.
As for those of you who still think that plantains make you stupid, this is for you: in India, when Alexander the Great arrived, bananas and plantains were known as “the fruit of the wise” because the Hindu Brahmins used to meditate under the shady leaves of banana or plantain trees. So there! In defense of our popular fruit, Himilce A. Tejada, a well-known Dominican food writer, brings us this article, which puts an end to a popular, but erroneous belief that plantains make us stupid. 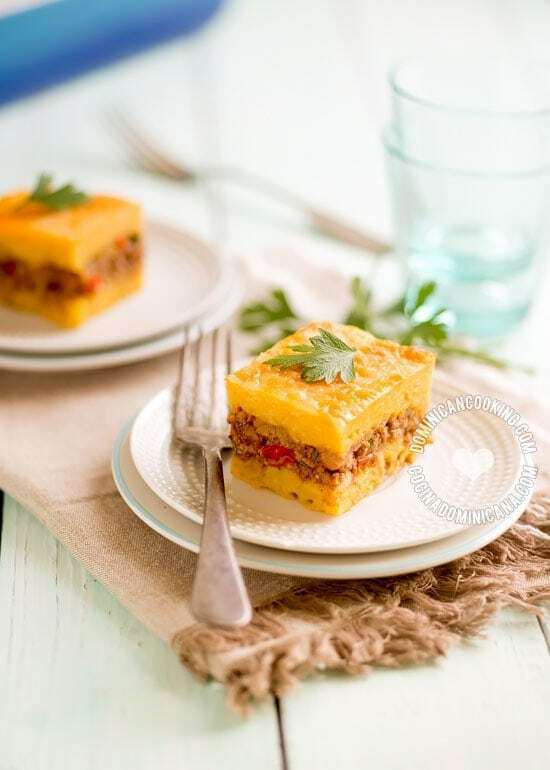 Pastelón de Plátano Maduro Recipe (Ripe Plantain Casserole): The delicate sweetness of ripe plantains, flavorful beef filling, and melting cheese.Pure bliss. Butter a 1-inch tall baking pan. Find recipe and instructions for filling here. Peel the plantains and boil adding 1 teaspoon of salt to the water. Once the plantains are very tender and remove from the heat. Take the plantains out of the water and mash them with a fork. Add the butter and keep mashing until it is very smooth. Put half of the plantains mixture in the baking pan. Cover with half of the cheese. Cover the cheese with the meat. Cover with the remaining plantain mixture. Cover with the rest of the cheese. Bake until the top is golden brown. It will be easier to serve if you wait five minutes after removing from the oven. Your choice of cheese and the order in which the layers are distributed is a matter of taste. Basically, any cheese that melts works, I like mixing cheddar and mozzarella, for example, while some people like placing the cheese right after the meat layer. Hi aunt clara..how ripe shud the plantains be..im thinking to ripe wud me to mushy.. The peel should be like 50% black. Can I assemble the night before? Yes, refrigerate and bake the following day. Doña Clara, I would even suggest cooking it the night before, refrigerating it, and then heating it up the next day. The flavors are so much better the following day. That is a great idea for parties. exactly what size of pan do you use for this? I want to make this recipe. 9 1/2 x 12 x 3 inches. Something of similar size would work. Puerto Ricans make this also and I call it Puerto Rican lasagna.